It was announced on April 20th, 2016 that Force of Nature would receive a nerf. Mana cost reduce to 5, down from 6. The Treants summoned no longer have Charge. The Treants summoned no longer die at the end of your turn. 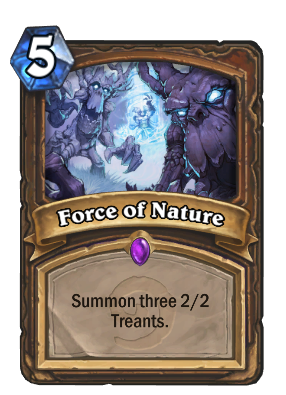 The new version of Force of Nature lowers its mana cost by 1, but removes Charge and makes the summoned Treants permanent—like the other Treants that Druids summon. This change also removes the powerful one-turn combo of Force of Nature and Savage Roar. 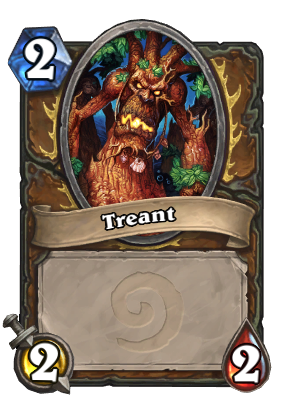 Now, opponents will have a chance to deal with the threat that the Treants represent, and it won’t feel mandatory to always include the combo. Maybe this can be buffed with Rush? That or a cost reduction to 4 mana. It'd seem in line with Saronite Chain Gang's power level, especially since this is a class card. Came here just to suggest the same thing considering the direction the new expansion is taking the Druid decks. This with rush would be playable in Treant decks most likely. These guys all die to a card like Consecration or Holy Nova whereas Kara Kazham! leaves you with a 3/1. also kara allows you to trade better into uneven health pool minions. a 5 hp minion? put in 3/3 and 2/2, rather than 3 2/2s! This should be changed, Doppelgangster is the definition of power creep. 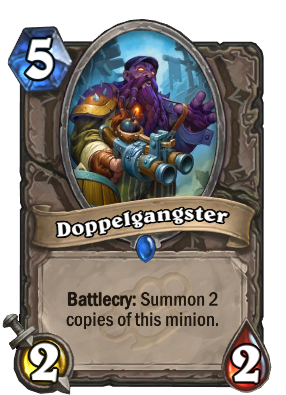 Doppelgangster is a rare, all-class, minion (can be buffed by spells), and Counterspell fully destroys Force of Nature meanwhile Doppelgangster survives Potion of Polymorph and is good vs Mirror Entity. Now you might say, "BUT MUH ARCANE GIANTS AND YOGG SARON". All druid decks already have tons of spells in them so that's not even a problem and now Yogg isn't even that good anymore. Oh and, don't let me get started on Brann. Tokens are also lower mana cost if you somehow get an evolve/get devolved. Well, atleast the FoN art is cooler. Help! I can't open any other epic in my classic packs ever since the nerf. RIP FON, card is terrible and will not see play now. Silver Hand Knight is better. It was even worse if the cards were dropped in cost by Emperor. But two fireballs sitting at 8 mana for 12 damage is okay, right? Oh. Forgot about Frost bolt for a nice total of 15 damage for 10 mana. Or is that still op? This force of nature is so OP and possibly better than the last version. There are people who actually enjoy playing druid, you know. I'm glad the combo was nerfed, but I always tought that Savage Roar was the problem. In my opinion, playing Force of Nature just for the removal should still be an option. This also mean that Egg Druid will not be nerfed. I wanted to see Druids a bit more orientated towards control or ramp, because there are so much nice cards that Druids could be exploiting such as Aviana, Cenarius, Baron Geddon, Tree of Life, etc.